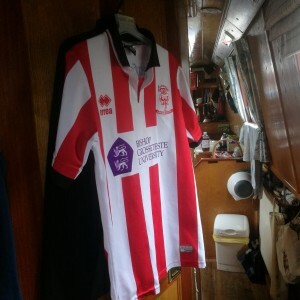 Narrowboating Chick | Back to Work and Source Some Funding. Well, at the moment we seem to be ranging from 2 opposing emotions. One minute we are happily thinking to ourselves “hey man, this is cool- a little bit of extra debt we can handle and we can cut back on other things and at the end we’ll own a boat- aren’t we just the greatest” (imagine that last sentence lying in a deck chair, sunglasses on and ice cold drink- you’ll get the picture!!). The next it’s OMFG!!!! PANIC, PANIC MR MANNERING!!!!!!!!!! HOW MUCH WILL WE OWE AT THE END???? ?…….no imagination needed there. First day back at the unit and I’m on my own I’m desperate to phone the bank to see if & how much they will lend- We are thinking of a “bridging loan” until we can sell the trailer & motorhome, in our own time and for the right price and still own Ambassador before someone else decides to buy her from under our noses. However, work comes first and I clear the backlog of parcels and bore myself stoopid packing boxes of plasters- seriously, there were loads. Got to call the bank later on and go through the loan application. It was referred to the lending dept and as I was late calling, I was unable to be put through for an answer- ok, we can wait another day for the answer we so desperatley want to be “yes”- Thanks HSBC. I have also called Barclaycard in an attempt to transfer the high credit limit from one card to the other Barclaycard with a spiffing 6.9% apr on ALL purchases- that’s the way to go- Credit card debit is sa manageable and flexible- the more you pay off, the less interest you pay, whereas a loan is fixed pound of flesh, sorry interest, and there’s no getting away from it- early redemption even carries a penalty! Anyway, digression is doing it’s thing, as Barclaycard are making me wait too, whilst they link the accounts. Sigh. I’ll call again in a couple of days.